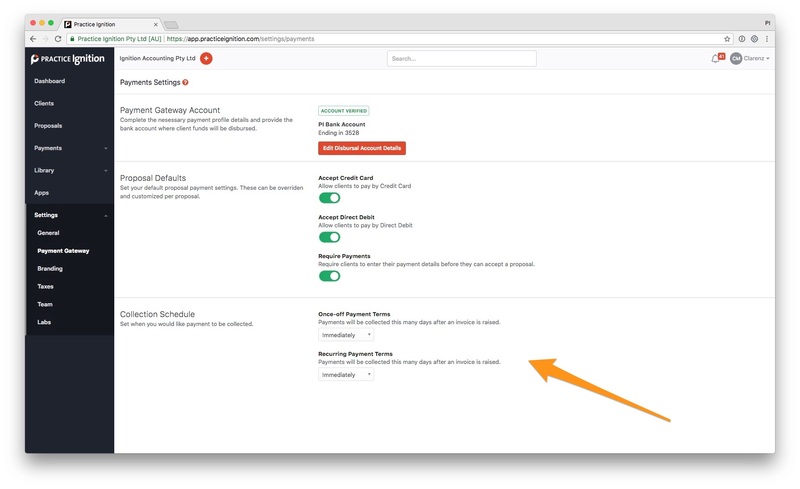 Practice ignition allows you to set up payment terms for your recurring and non-recurring invoices. You can set the number of days when the payment will be collected after the invoice has been created/issued. You can find the payment term settings by going into Settings > Payment Gateway > Collection Schedule. When will payment start collecting? The number that you set under the payment term field is the number of days AFTER the invoice is created. Example: If you choose immediately, then the payment will start collecting the same date as the invoice creation date. If you enter 14, and your recurring invoices are created every 1st of the month, then the payment will be collected on the 15th of the month. Note: It is important to consider your recurring invoice date. Example, if your recurring invoices are created on the 1st of the month, and your payment terms are 7, then payment on recurring invoices will always be collected on the 8th of the month. If your recurring invoice date is the 28th, and you make your payment terms 7, then some months it will fall on 4th of the month, and others it will be the 5th. If the payment is yet to be processed, you can change the collection date by clicking on the cog beside the invoice. Learn more about it here.